What connects The Beatles, Michael Jackson, William Shakespeare, Rudyard Kipling and J K Rowling? 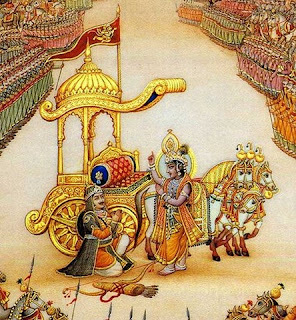 The message that the Bhagavad Gita seeks to send out finds its echo in their works. Author Roopa Pai embarks on a spirited, one-of-a-kind retelling of the epic conversation between Pandava prince Arjuna and his mentor and friend Krishna and tries to bust several myths about the Bhagavad Gita in "The Gita For Children," a thought-provoking book for young adults published by Hachette India. She infuses her retelling of, what she calls, India's blockbuster bestseller "Book With Answers" with wit and humour and even uses analogies of The Beatles, Jackson, Kipling, Shakespeare and Rowling among others. According to Pai, two of the most beloved singer- songwriters of the 20th century Paul McCartney and Jackson had their own unique ways of conveying the message that the Gita does - everyone's the same on the inside. "In his song 'Ebony and Ivory,' McCartney wondered poignantly why people who are different colours on the outside, cannot seem to live in friendship with one another, when the black and white keys on his piano keyboard do so with such perfect harmony, producing beautiful music together," she says. "A generation later, in his similarly titled song 'Black or White', Jackson urged his listeners to understand that it wasn't colour or race that made people different from one another, but what they were like in their hearts and minds. Once you understood that, he said, anyone could become your brother (or sister) - it really wouldn't matter if they were black or white," the author says. Even Shakespeare apparently agreed with Krishna that we have little control over the script of our lives, she argues. In "As You Like It", he said: "All the world's a stage, And all the men and women merely players." Then the author draws an analogy with Rudyard Kipling's "If" to stress on Gita's philosophy.